Damien Oliver, whose heart never rules his head, gave punters the perfect tip in the days leading into Saturday’s hard-slog P.B. Lawrence Stakes at Caulfield. Oliver sacked both Lord Of The Sky and Suavito to ride Miss Rose De Lago for trainer Danny O’Brien, a man who found the racetrack a welcome sanctuary on Saturday. Oliver thought Miss Rose De Lago was the one to beat — but punters refused to cop the tip. As Oliver wandered into the mounting yard for the Lawrence, he glanced at the giant tote screen on the infield and raised an eyebrow. “Why isn’t this favourite?’’ he quipped to O’Brien. Oliver has made a career of sacking horses and backing his judgment. He’d won first-up aboard the flying Lord Of The Sky, a win that drew tears from trainer Robbie Laing but a salute and no ongoing commitment from Oliver. Oliver had also had a successful association with Suavito but wiped her as well. Oliver may well have looked at the tote board and wondered how Suavito could start $4.80 and Miss Rose De Lago $8. In a jump-out a week or so prior, Miss Rose De Lago had delivered Suavito a flogging. Oliver would have looked at the $10 on offer about Lord Of The Sky and probably concluded he was “unders”. The speed map, racing’s trendiest and most useful tool, predicted a brutal tempo that would test Lord Of The Sky and The Cleaner — spot on — and play to a runner close enough to pounce but far enough back not to be suckered into the crazy upfront battle. Oliver found himself pretty much where the map had him; cruising along on the rails in third or fourth, then claiming the leaders and fending off the swoopers. Miss Rose De Lago held the late charge of handicapper Jacquinot Bay ($17) to win by a half length. A swarm of good horses finished heads, half lengths and noses behind the winner in a pivotal carnival curtain raider where the first 10 home finished within three lengths of each other. Oliver was pleased with the horse and thrilled for the trainer, who has endured what must seem an eternity in various appeal courts in a bid to save his career. O’Brien’s cobalt hearing before the Victorian Civil and Administrative Tribunal resumes on September 5, allowing him some racetrack respite. “Full credit to Danny O’Brien, she’s been going well. We’re good mates and nice to get a winner for him,’’ Oliver said. 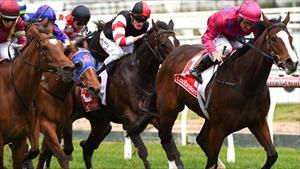 O’Brien said the breakneck speed and Miss Rose De Lago’s penchant for Caulfield played perfectly into her hands. "She’s had four wins from five starts here and it all went to plan for her today. She needs that solid tempo to be effective at 1400," he said. "She was able to soak it up and still be strong on the line." In retrospect, it was never going to work out for The Cleaner with Lord Of The Sky in the race — and vice versa. Lord Of The Sky pushed hard from a wide alley in the middle stages as he worked alongside The Cleaner, who was having his first start for Peter Gelagotis. Both began to wobble on the turn but ran well enough, fading to finish just a couple of lengths from the winner. The good horses all ran well. Jameka weaved home for an impressive fourth, Suavito ran on well and now needs blinkers according to jockey Michael Walker. Mahuta showed his usual courage to cling to fourth after riding the speed and Awesome Rock, robbed of the Australian Cup in the autumn in the stewards room, ran a close 10th after striking traffic in the straight.